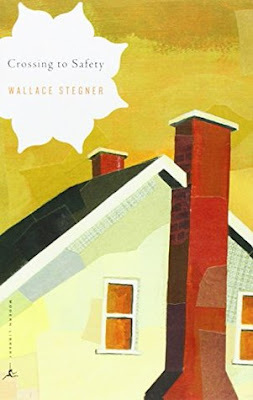 Several years ago, my book club read Angle of Repose by Wallace Stegner. I can probably count on one hand the number of book club books I haven't read, but that is one of them (I think I knew I wasn't going to be able to make the meeting, so I decided not to commit to a 550-page book if I wasn't going to have anyone to discuss it with afterwards). So I read it. And I loved it. Like, really really loved it. And then I was intimidated to write about it because I loved it so much. But I couldn't bear the thought of it fading from memory over time, so I decided to buckle down and crank out my thoughts, as inadequate as they might be (there may be some inadvertent spoilers, just a heads up). It's not that it's a particularly happy novel, but it's also not a particularly sad novel. It's just kind of a mix of both, just like real life. The story is retrospective in nature. Larry and Sally Morgan are returning to visit their best friends, Sid and Charity Lang, after many years away, and Larry's thoughts naturally go back forty years before when they were both young married couples with big dreams in front of them. They met in Madison, Wisconsin soon after Larry took a job teaching creative writing at the college. It's the 1930's, so of course he's grateful for any job he can get, even though this one was not advertised as a permanent position. Sid Lang is also on the English faculty, hoping he can publish enough academic papers to get tenure (even though he'd rather by writing poetry). Charity Lang and Sally are both pregnant (Charity with her third, Sally with her first). Their friendship takes root almost immediately. It's one of those rare instances where the wives get along and the husbands get along and the couples get along (Mike and I have about four such friendships, and we treasure each one of them). The Langs are gregarious and supportive and generous. They like everyone, but no one as much as the Morgans. They are also very wealthy due to an inheritance from Sid's father. The Morgans are barely making ends meet (luckily, as Larry says, "With the right wife, and I had her, deprivation becomes a game"). This disparity in finances could have made the friendship between these couples awkward, especially since the Langs are only too eager to help the Morgans at the least sign of need, but Larry has a talent for writing that Sid envies, and that seems to even things up a little. Although some very real and heartbreaking things happen during the course of the narrative (Sally contracts polio, Sid's career flounders, Charity is diagnosed with cancer), it was the relationships themselves that kept me riveted. In particular, there is an interesting dynamic between Sid and Charity. Although it's obvious that they love each other, there is no doubt that Charity has to be in control--from little things, like taking a photo of Sid even when he has asked her not to, to big things, like demanding that they stay in Madison and that he teach a subject he's not passionate about. There's one scene especially that I keep thinking about. In it, the Morgans and the Langs are about to leave on a week-long camping trip. As usual, Charity has organized the whole thing down to the most minute detail. She has an extensive list, but they all forgot to consult it, and now everything is packed and ready to go. She can't bear the thought that they might not bring something important (or maybe she's more worried that they'll have a fine trip even without every item on the list), and so she does the totally irrational thing of making them unpack everything and go back through the list, checking off each item before repacking it. Sid is frustrated but does as she asks. Then he takes the walking cane that she has insisted he use and heads off with Larry, who has a cane of his own. Larry admits, only to himself, "I kind of like my cane, but then, nobody's making me carry it." I couldn't help but think that's probably the way it is with a lot of things, in careers and marriages and parenting. When someone forces us to do something, it's irritating, even if it's something we would have chosen to do on our own. We just want the freedom to decide for ourselves. Much later in the story, when it returns to the present, Charity is in the final stages of cancer. With death, as with everything else, she has a plan, and she will not swerve from it, even though Sid is completely broken because of it. He wants her to keep fighting, but she says, "Hope would be foolish for me. It wouldn't do me any good to set my will on living. I thought it would, before I had the operation. That's why I had it. I had so much to live for, I was determined to live. But they just sewed me up again, and I had to learn to face the facts and make the most of what time I had left." It's an interesting conflict of interests, hers versus Sid's, and you get the impression that maybe they've never had the kind of marriage you'd hope for in one of nearly fifty years. Towards the end of the book, Sid and Larry have a poignant conversation. Sid admits that he's "taken a bit of comfort in [Larry's] bad luck." He says, "You've always thought my marriage was a kind of slavery," but he knows that, in his own way, Larry was also trapped by his marriage, "tied and helpless, though for very different reasons." He speculates, wonders, if Sally hadn't gotten polio if Larry would have stayed as faithful to her? If she hadn't needed him so much, and he'd had more time to develop his talents, would they have grown apart? And then he says this: "[Sally] couldn't survive you? Could you survive her?" He's asking it because he realizes how dependent he's become on Charity for everything. He doesn't know if he'll be able to survive her after she's gone. Larry says that both he and Sally would be able to survive the other because that's just what you do, but you can see how these themes of freedom and choice and love and sacrifice permeate the entire book. At one point, Larry is talking to the Lang's adult daughter, Hallie. She is begging him to write a book about her parents, but he refuses. He asks himself, "How do you make a book that anyone will read out of lives as quiet as these?" But of course, that's exactly what this book is, and, it turns out, this is how you do it. Have you read this book? Which parts have stayed with you? And what do you think the title is referring to? Also, unrelated to this post, but I wanted to let you know that Episode 5 of The Book Blab will be airing live on Thursday, April 21st, at 7:00 MST. I hope you'll join Suzanne and me as we discuss how we make time for reading. The live feed will be right here on the blog or you can visit this link. See you then! I've never heard of this book before, but it sounds really interesting. Is The Book Blab a podcast that you do? So a blab is actually a new social media platform...kind of a cross between periscope and google hangout. It's a live video between two or more people, but then viewers can comment on the side. We named our little show The Book Blab since we're using the blab platform. It's been really fun so far. We always post the recorded video with show notes afterwards, so you can watch it anytime! Yay! I'm sooo glad you liked this book, because I just knew you would, but then when you didn't post about it for a while (because I knew you were reading it) I was afraid you maybe didn't like it, and I wondered, "Do I not know Amy at all? Because how could she not like Crossing to Safety?" This is definitely one of my top favorites, and reading your post reminded me that I need to read it again. Angle of Repose is good too, but not nearly as good as this one, in my opinion. Oh no, definitely loved it! You know my tastes! I just always find books I love SO intimidating to write about! Dear Amy! It's so fun to read your blog, but I especially love this post and so had to comment. Crossing to Safety is probably my very favorite book (so hard to choose just one! -- A Tree Grows in Brooklyn is also a treasured favorite). I have read CTS multiple times over the years and with each reading I love it more. Wallace Stegner is definitely my favorite author. There are no superfluous words in any of his books; he was definitely a master writer and such a joy to read. Someday read Angle of Repose and All the Little Live Things. They are both wonderful too. Janene, it is so fun to hear from you! Treasured books are the best ways to keep in touch! I am sure Crossing to Safety will be a book I'll read again, and I'm definitely interested in reading more by Stegner. P.S. A Tree Grows in Brooklyn is a favorite of mine as well! Hmmmm, that's so interesting that you thought of Charity as a despicable character! I can't say that I had such a strong dislike for her. Of course, there were times I wanted to strangle her, but she was also such a vivacious person, and what she did for Sally and Larry when Sally contracted polio was truly selfless. I think that's why I liked the book so much--all of the characters were very real to me. I could see the good and the bad in Charity, and I think I was more sympathetic towards her because of it. And I love your take on the title! That makes total sense. I wish we could sit down on our old porch at the white duplex and have a real heart-to-heart with this book. That would be delightful! I didn't read your whole post, as you mentioned spoilers, but I do want to read the book. I read Angle of Repose one day when I was up at the cabin and I seriously loved it. Like, seriously. It just really spoke to me and like you said, it was a mixture of happy and sad and felt very real. I'm excited to try another Wallace Stenger book.